Ross County midfielder Michael Gardyne. Gardyne hails Ian Forbes as a big influence on his career, even getting him a pair of boots, despite his first love being rugby rather than football. Since he came into Gardyne’s life at the age of 12, Forbes has been avid follower of his step-son’s progress, along with Gardyne’s mother Angela. Both will be in attendance for today’s final against Connah’s Quay Nomads – top of the Welsh Premier League – in Inverness and Gardyne hopes Forbes will back Staggie blue over his homeland. He said: “He’ll be supporting me, rather than Connah’s Quay. Since he came on the scene, when I was 12, he’s been the top man. He came up from Wales and got me a proper pair of boots. Then, a couple of weeks later, I signed for Celtic. “He’s always been a rugby fan, but when he came into the family he has become a football fan and just supported me, him and my wee mother, wherever I’ve gone in my career. “I don’t think he was interested in football before – Wales is big into rugby, isn’t it? He would always keep an eye on Cardiff and Swansea, but he was never really bothered until him and my mum got together. To be fair, him and my mum would always come to my Dundee West games every Saturday or Sunday and it has kicked on from there. They’re based down in Dundee, but still come to as many games as they can. Gardyne, in his fourth spell with the Staggies, has played in the final three times for the club, coming out on the winning side twice. He was part of the winning team in 2011 and the side that went on to achieve promotion to the Premiership for the first time a year later. 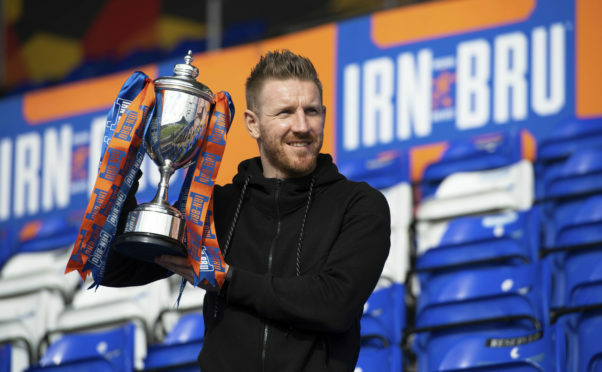 Gardyne added: “It was before Christmas last time I won it, but it really didn’t help me because we got relegated that season. It didn’t mean much that season. That was my season on-loan from Celtic.